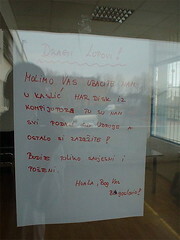 A note to thieves - Laughs! Thrills! Pathos! Please could you return to us the hard disk from the computer, as it containts all data for the company, and you keep the rest! Please be so decent and honest. That's both extremely sad and very funny at the same time. Appealing to the decency & honesty of a bunch of thieves doesn't seem like a great business strategy. On the bright side, the business owner has now learnt the importance of keeping back-ups of important data. And perhaps neither does telling them all about the location of your data. Though they'd probably have had a look anyway.